Welcome to our beautifully refurbished 6 bedroom, 3 bathroom villa located within a 20 minute drive from Disney’s maingate. You will love swimming in the private south east facing heated pool and relaxing under the lanai looking out onto uninterrupted views of tranquil conservation land. With two spacious living and dining areas, our Villa comfortably accommodates up to 14 guests, ideal for multi-family or larger group bookings. We offer our guests complementary WiFi. The villa has two distinct living areas which you can adapt to your party’s needs. Upon entering the Villa you are welcomed into the Living Room, a quiet seating area where you will find: Queen Sofa Bed (Sleeps 2) and 2 large armchairs TV Sony PlayStation3 (Games Console & Blu-Ray Player) At the heart of the Villa is a large, bright and airy Family Room. Central to all areas of the villa it seamlessly connects indoor and outdoor living. For your entertainment, you will find: TV Board Games Blu-Ray Player Bose Sound Dock The formal Dining Area comfortably provides seating for up to 8 guests. The kitchen is fully equipped with a fridge/freezer, electric stove/oven, microwave, dishwasher, coffee maker, blender, toaster and enough dinnerware for your party. This gives you the freedom to decide if you would prefer to eat in or go out for your meals. There is also a washing machine and tumble dryer in the utility room for your use. In the Nook, there is a second full size table with seating for six people. The master bedroom is very spacious with a king size bed and a large en-suite bathroom featuring a garden tub, shower and separate wc. There are two large walk in closets and a TV in this bedroom. French doors lead onto the covered lanai revealing a relaxing view over the conservation area. Bedroom two has a queen-size bed and television, whilst bedroom three has two twin beds. Bedrooms two and three share a Jack and Jill bathroom with an over bath shower. The final three bedrooms are at the rear of the property, two of which have queen-size beds and televisions. The sixth bedroom has two twin beds. The third bathroom has a walk in shower and allows access to the pool area. The garage is being used as a games room for the enjoyment of all of our guests. It is equipped with a 2 in 1 pool/air hockey table and a foosball table. Outside on the spacious covered lanai there is a patio table and chairs allowing you to dine “alfresco”. The covered lanai enables you to enjoy the outdoors regardless of the weather. For the sun worshippers amongst your party, sun loungers are also provided. The enclosed pool provides a very quiet and relaxing area to enjoy breaks between the parks. For the enjoyment of our guests, a BBQ is also provided at no additional cost. For families with young children a complementary crib and highchair is provided as standard. 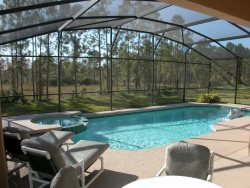 To provide extra safety there is a pool safety screen surrounding the pool. The villa is located within the ever popular community of Orange Tree. There is a good variety of local shops and restaurants nearby, with a Walmart and Publix (Food store) just five minutes down the road on US27. The Orange Tree community is surrounded by orange groves and has 2 playgrounds for younger children, a soccer field as well as tennis and basketball courts. It is conveniently located with easy access to the I4 interstate and within a 35 minute drive to all the theme parks.